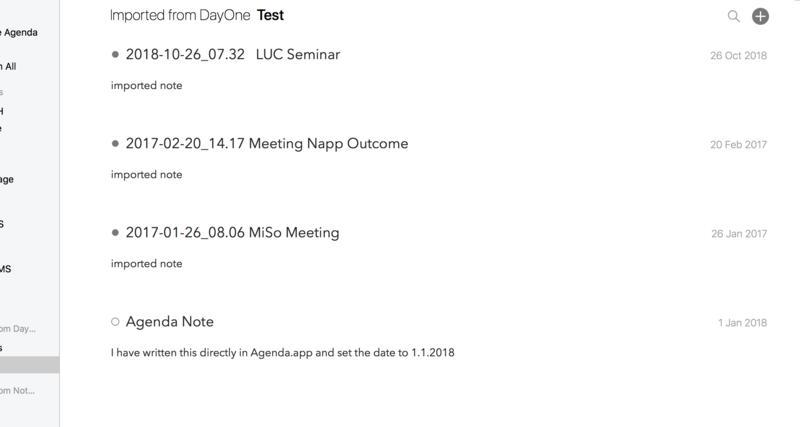 Is it possible for me to import notes from OneDay app? You can also use copy and paste, of course. Hi there, I just imported ~300 entries form DayOne Classic (DayOne Version 1). The entries are actual text files stored within the DayOne Journal package (Go to your Journal.dayone file, then click “Show Package Contents.” You’ll see two folders: “entries” and “photos. Open the entries folder). Each entry is a xml file ending with .doentry. One more thing. This script can’t work with empty entires and sometimes the filename gets too long. Those instances need manual work. One more question/wish: Could we get a option when importing to set the event date to the modification date of the file being imported? Superb. Thanks for the hint. Works great. What a time saver. One more question. 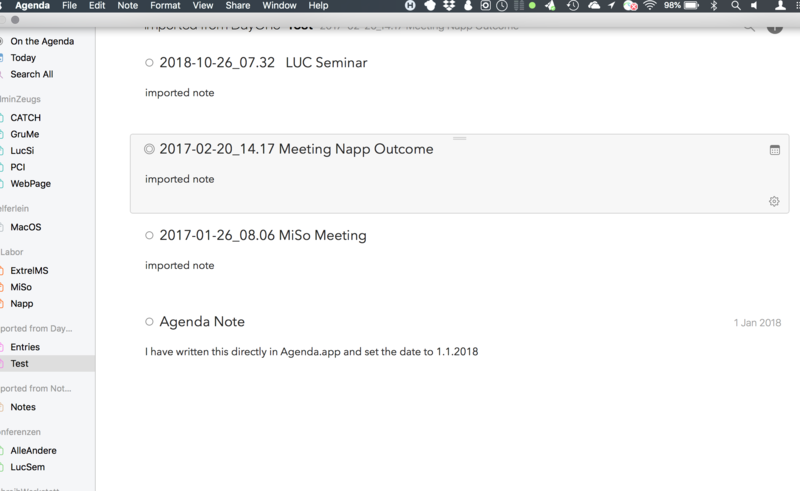 Sorting of notes within one project by date seems to be base on the last modified date in Agenda (i.e the date the note was imported and/or moved to a different project). So the imported notes are treated newer than those than those that have been written in Agenda prior to the import. Is there a way to always sort by creation date or the date that the note is assigned to? There is no real sorting of notes as such. You are free to manually drag them into other orders. The only constraints applied are that if there are actual dates assigned to the notes, those are chronological. A note with no date can be dragged anywhere. The import is just putting the notes at the top, but you can drag them down somewhere else. The only constraints applied are that if there are actual dates assigned to the notes, those are chronological. Thanks for the feedback. Then, there seems to be a bug. When I import notes, and assign dates to them after the import, those notes appear chronological relative to each other (and respond to changing the sorting order as expected) but compared to earlier notes with assigned date they are not chronological but always treated as if they were newer. Could you send us a screenshot illustrating what you describe? Yes, sure. Thanks for looking into this. First, I entered a note directly into Agena.app on MacOS on 13.1.2019 and changed the date back to 1.1.2018. Then, I imported 3 text files (markdown format) in the MacOS.app. Ah, so you are adding the notes via x-callback. That makes a big difference. I had assumed you were importing them via the UI. Hey guys, I was wondering whether you have a way to import a boatload of journal entries (2500ish) from DayOne? Is there any way to import a JSON archive?